Carl Frampton has outlined his plans before his IBF World Featherweight title clash against Josh Warrington at the Manchester Arena on December 22. Frampton will try to take the IBF belt off Warrington - the fight will be shown live on ESPN in America - before setting his sights on bigger prizes. “It is fantastic news that my bid to become a world champion again will be screened live on such a heavily subscribed US platform as ESPN+,” Frampton said. “It is always a thrill to know that your fights are being showcased to an American audience. “And I fully believe they will see something special from me on December 22 when I become a two-time world champion at featherweight. 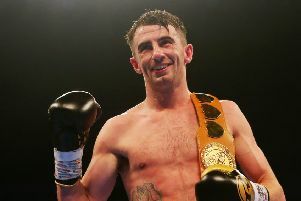 Belfast’s Michael Conlan, Paddy Barnes, Steven Ward will also feature on the Manchester bill.